If it hadn't been for radio, I might not have made it through my teen years. I had an enforced early bedtime—lights out by 9:30. To a night owl, that's cruel and unusual. Luckily I had a transistor radio. It was the size of a paperback book, with a snap-shut leather case and an earbud the shape and hardness of an acorn. I tucked the radio under my pillow and the earbud in the ear facing down, made sure the wire was concealed, and listened. There were fewer radio stations then and especially at night, radio waves traveled many miles and brought music and deejays from far away. This is how I first heard Simon & Garfunkel's "The Sound of Silence"—alone in my inky room, the house asleep around me—which is the best time to hear "Hello darkness, my old friend." Today I'm a fan of public radio: KBEM, KFAI, MPR. Our rental car in Florida had Sirius satellite radio and that was fun for a few days but here I'm happy with Kevin O'Connor's drive-time show, late night with Bob Parlocha (which airs on KBEM), KFAI's eclectic variety, MPR's news programming, and the Current. 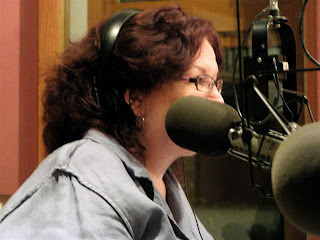 Janis Lane-Ewart of KFAI and I had talked for a while about doing an all-Kurt Elling show. We're both Kurt fans; we've seen him together at the Dakota and at Birdland in NYC. He's the only performer I have actually traveled to see; he's been the excuse for a trip to Chicago (the Man in the Air CD release), my second Monterey Jazz Festival in 2006, and Valentine's Day in NYC this year. 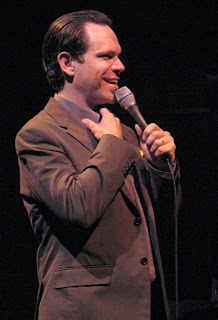 Last night (5/29/08) I was Janis's guest on her weekly "Collective Eye" radio show, with 90 minutes of Kurt Elling songs, vocalese, scatting, and spoken word. It went well and we plan to do it again, hopefully with Kurt joining us on the phone. The show will be archived for 2 weeks for streaming. Find the playlist here. Photo of yours truly by John Whiting. 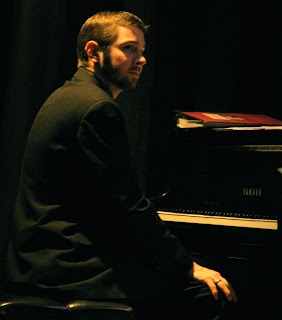 This week's MinnPost column features Tanner Taylor, a young pianist who hails from Iowa and has been burning up keyboards all over Minneapolis/St. Paul since relocating here seven years ago. I enjoy hearing him play, other musicians respect him, and he works hard. I was glad to have the chance to write about him. During our telephone interview, I asked him about something I had read on Jazz Police: that his first inspiration to try jazz came "after seeing The Glenn Miller Story when I was twelve." Yes, he said, that's true. I had seen the movie (1954, directed by Anthony Mann, starring James Stewart and June Allyson) for the first time a few weeks earlier and decided to share something I had learned from the post-film commentary. "You know," I babbled, "there's this new theory about how Glenn Miller died—that his plane was hit by a bomb dropped by a British plane returning home from France. Rather than land in England with live bombs, they dropped them into the Channel." "Actually," Tanner said, "there are three theories about how he died. I'm a huge Glenn Miller fan." Note to self: Resist the urge to tell musicians things they probably already know. 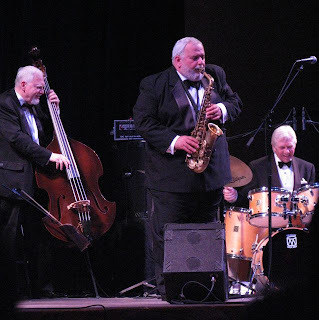 Gordy Johnson is one of the reasons jazz is so strong in the Twin Cities. His appearance on any stage is a guarantee of a fine performance. Maybe it's because bass players often stand in one place all night long and play large instruments that they seem rock-like and stalwart. 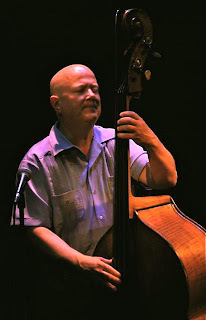 With his broad forehead, shaved dome, and commanding presence, Gordy is kind of a Mount Rushmore of bass players. His tone is beautiful and his playing always engaging. I often find myself watching Gordy when the star of the evening is a singer, a pianist, or a horn player—not because he calls attention to himself but because I like him so much. He has just released the fourth CD in his "Trios" series. 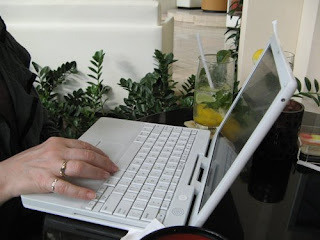 How the series came about and what might happen next are reported in my MinnPost column for Friday, May 16. Because we were at the Dave Brubeck Quartet concert at Orchestra Hall, we missed the first two sets of Gordy's CD release at the Dakota (with pianists Laura Caviani and Bryan Nichols) but were able to catch the third with Tanner Taylor. First up, the fireworks of "Bouncing with Bud," followed by the lilting elegance of Tanner's composition "Evanesque." Gordy is wearing a Mexican shirt given to him by pianist Chris Lomheim; he looks relaxed and happy. It's an open curtain show and the house is nearly full. Many musicians are in the crowd: Mary Louise Knutson and Michael Nelson, Lucia Newell, Connie Evingson. Next: "Wrap Your Troubles in Dreams," a track from Gordy's first "Trios" CD, where it was played by the late Bobby Peterson. Gordy mentions that Tanner sounds a bit like Bobby—"a powerful player." Then a Dizzy Gillespie tune, "Con Alma," a deliciously languid "Li'l Darlin'," and "Close Your Eyes." Finally "Blues for C.J.," a song Gordy wrote for his father, the late Clifford Johnson, a bass player for many years for the Minnesota Orchestra. It's the first song on the new CD and the last of the night. He and Phil Hey have been playing since 7 and it's time to go home. All day, the weather has been threatening; I've gotten frequent MyCast emails about tornado warnings and watches. About an hour before we leave home for Orchestra Hall, the town of Hugo northeast of the Twin Cities will be pounded. I'm reminded of the last time I saw Brubeck in Minneapolis, on June 24, 2003. As we listened to the music, sirens wailed. On the way home we had to drive up an entrance ramp to the freeway (the wrong way) because an underpass ahead was flooded. Trees were down and power was out all around us. Because of the weather today, and perhaps reminded of the weather five years ago, Brubeck dedicates the first part of his concert to...the weather. We hear "Gone with the Wind," "Stormy Weather," "On the Sunny Side of the Street," and "Over the Rainbow." Given Brubeck's many years of playing and his incalculably huge inner library of songs, he could probably play weather-related tunes for a week without repeating himself. 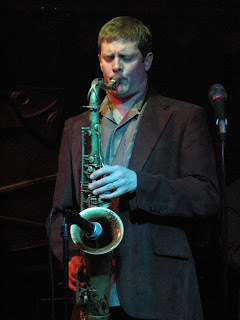 I recently listened to Time Out, so whenever Militello plays the sax, I can't help thinking of Paul Desmond. But when he plays the flute I'm here and now. I'm not normally a big fan of jazz flute but "Over the Rainbow" is an elegant arrangement of an old familiar tune and I like it very much. Orchestra Hall seems packed to the rafters—sold out? It seems that everyone who didn't leave town for Memorial Day weekend is here. Why wouldn't they come to see an 88-year-old legend who's still composing, still performing, still influential? Being in his presence is a privilege and a pleasure. I'm glad to be sitting in row 8 but I'm disappointed in the sound. Orchestra Hall hasn't yet figured out how to mike jazz performances. The Minnesota Orchestra sounds fantastic in this big, long box, but anything smaller is hit or miss. Tonight the piano is murky, the drums too loud, the saxophone too brassy, the bass very hard to hear unless Moore solos and even then it's faint. Post-intermission: "Margie." A song I haven't heard for years. ("Margie, you've been my inspiration....") Such sweet swing. "My Fats," dedicated to Fats Waller. 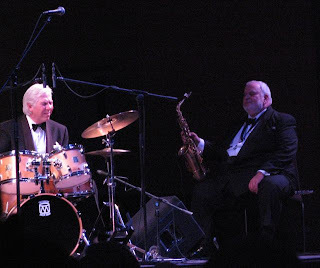 Brubeck smiles broadly during Militello's solo. 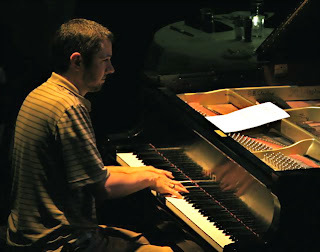 On "Yesterdays," Brubeck's fingers fly across the keys on his solo opener; Militello plays like a 30-year-old. 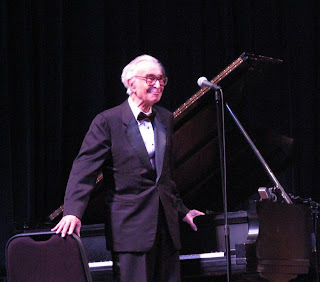 Next, because it's Memorial Day weekend, the quartet plays a tune called "Weep No More," written by Brubeck in 1945 after the Battle of the Bulge ("I was there," he tells the crowd). It's solemn and beautiful, measured and deliberate, classical...are they also playing Bach? Jones uses mallets and his drums sound like distant thunder, or heavy fire. No segue, no introduction, just a sudden rapturous lift-off into "Take Five," a song I could hear every day for the rest of my life and still enjoy. Militello has been part of Brubeck's quartet since 1982—26 years—so I guess I should get over Desmond. He tosses in a quote from "Blue Rondo a la Turk." Two rows ahead of us, a young boy, maybe six or seven, bounces up and down in his seat in time to the music. A single encore: a brief version of Brahms's Lullabye. Time to go. If we hurry, we can catch Gordy Johnson's final set at the Dakota. Live music deprived, craving jazz, we head straight to the AQ on our second night back in town. 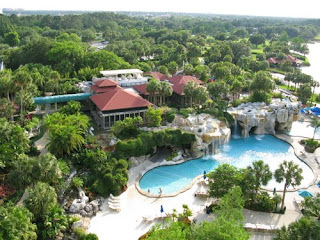 (Flying home from Orlando in a full, grimy plane with crying babies and children who stuck things up their noses wore us out for the first night.) Can't imagine a better welcome home than tenor sax monster Alexander and "musician's musician" Hazeltine (that's TINE with a long a, not TEEN). We hear "Alone Together," "Sweet and Lovely," and Jobim's "O Grande Amor." Alexander and Hazeltine play together a lot in NYC and it shows in their simpatico. Jimmy Webb's "Didn't We" gets a flashy, splashy piano intro followed by mellow, buttery sax. Alexander takes an unaccompanied solo in the middle, lengthy and ruminative and satisfying. I want him to keep playing. It's a big dose of Vitamin J. On the low-down, dirty "Kansas City Blues," his serene bassmaster Lewis takes a solo (he later says he's surprised it went on for so long) and it's splendid. The sax bleats, the piano rumbles, the drums beat a steady rhythm and the group segues right into a speedy "The Song Is You." Kenny plays a bashy solo and that's it for the set. Jon Weber and Bill Carrothers have trained me to stay alert for quotes. I don't hear any in Alexander's playing. Maybe I just don't know what he's quoting; it all sounds like pure invention to me. I ask him about this later and he says he doesn't quote much. "Should I quote more?" he asks. No, please, just keep doing that warm, golden, swinging, shining hard-bop thing you do. 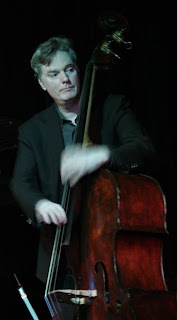 Photo of Tom Lewis by John Whiting. A sequel to MnMo on jazz, sort of. Glory be, Minnesota Monthly printed a letter I wrote in response to editor Andrew Putz's comments on how hard jazz is to understand, appreciate, love, and find. I read with interest and growing dismay your assertions that jazz is “too damn hard—hard to understand, hard to appreciate…even hard to find,” and that it only happens at the Dakota, the Artists’ Quarter, and now, Orchestra Hall (“Hot Summer Nights”). The Twin Cities has a thriving jazz community with many artists performing in several places pretty much any night of the week. The Dakota and the Artists’ Quarter are primary venues, of course, but we also have the Northrop Jazz Season, jazz at the Walker, and concerts at MacPhail. Finding jazz isn’t hard. Understanding, appreciating, and loving jazz comes with experiencing it. I read with interest and growing dismay editor Andrew Putz's assertions (Hot Summer Nights) that jazz is "too damn hard"—hard to understand, hard to appreciate, hard to love, hard to find—and that it only happens at the Dakota, the Artists’ Quarter, and now Orchestra Hall. The Twin Cities is a thriving jazz community with many artists performing in several places pretty much any night of the week. The Dakota and the AQ are primary venues, of course, and three cheers for Lilly Schwartz, the person behind the new jazz series at Orchestra Hall, but we also have the Northrop Jazz Season, jazz at the Walker, the Twin Cities Jazz Society’s “Jazz from J to Z” concert series (which happens in various places), jazz at MacPhail, the Twin Cities Summer Jazz Festival, the Winter Jazz Fest, the JazzMN Big Band, and live jazz in numerous restaurants, bars, and community centers around town. Jazz is not illegal dog fighting; you can find it by checking Friday’s Strib, the Jazz Police Web site (www.jazzpolice.com), and my weekly jazz column on MinnPost.com. You can even check the Minnesota Monthly Web site; type “jazz” in the search window. Minnesota Public Radio sends out a weekly jazz calendar, and so does KBEM, our local jazz radio station (and one of the few remaining in the nation). So finding jazz isn’t hard. Understanding, appreciating, and loving jazz come with experiencing it. Andrew, I invite you to be my guest at an upcoming jazz event, and let’s say for starters that it won’t be at the Dakota, the AQ, or even Orchestra Hall. Dan books the Dakota Late Night shows and also takes very good care of us at the club. I hear he plays the trumpet but haven't yet heard him play--maybe he'll let us know about a show sometime because we do show up at performances by Dakota staff, just ask Kendra. (Though we haven't seen Jessie Bryan's Say Lovey yet, we will.) Dan is a young dude so I gave him a bright green stripe. 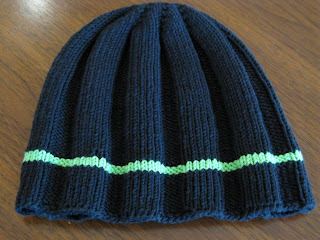 Dana knits, too, and I hope she's not offended that I made her man a hat. 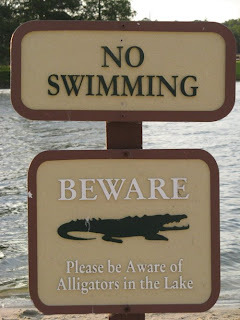 A few more images and we're off this topic. 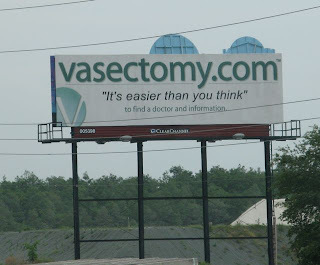 Fun Florida billboard! How easy is it exactly? 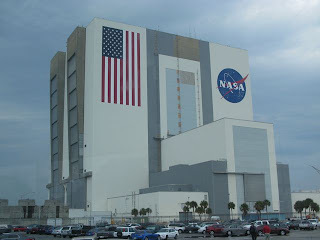 The Kennedy Space Center (45 miles outside Orlando) is cool. (Thanks to Andy Svenson for suggesting we go there.) 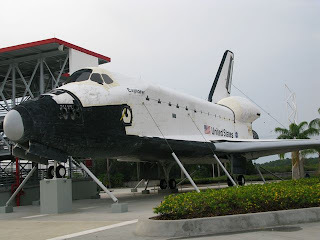 Did you know the shuttle program has very few missions remaining before it ends? I didn't. 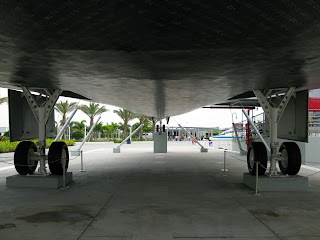 We went inside the space shuttle Explorer. 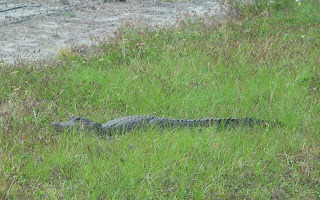 The Space Center's all-natural, genuinely green security system. This little fellow was right outside our bus. We also saw wild boar and eagles' nests. 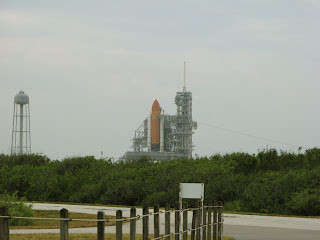 Launch Pad 39A, where the Space Shuttle Discovery waits for 5:02 p.m. EDT on May 31. 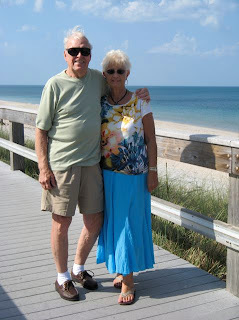 We visited the 'rents in Vero Beach. Hi Dad, hi Gini! Stupidly rode there in a convertible with the top down. Can I spell S-U-N-B-U-R-N? Apparently not. I'm on a tear re: the pathetic lack of jazz in a city that draws 50 million tourists each year to its theme parks and T-shirt shops. Don Berryman, Chief of the Jazz Police, reminded me of an article he wrote on this topic. I like it so much I've asked his permission to post it here. It's longer than a usual post so go get a cup of coffee or something. 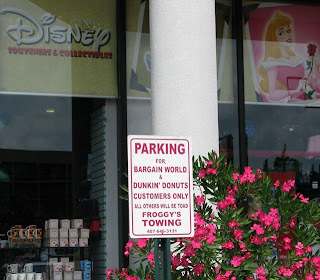 Jazz Police bust Disney in Orlando! Just because the Rat has big ears °o°, don't assume he can hear jazz. I suppose I should have known better than to expect jazz in Disneyland on my recent visit to Orlando. But I surmised that here are huge entertainment companies that hire many talented musicians, these guys have got to find a place to play and listen to some good jazz. Also I was pleasantly surprised by a great local jazz radio station, WUFC at 89.9 FM, and assumed if there was support for jazz radio there must be a local audience for live jazz. After spending the day with my folks at the many Disney Worlds, Beverly and I were ready for some serious music from the real world. I had heard a terrific tuba solo in Frontier Land that demonstrated great chops, but the material left much to be desired. We decided our best bet for good music was away from Disney/Universal et al so we decided to head downtown to the Bösendorfer Lounge at the Westin Hotel where they billed a jazz band. There was an accident on I-75 so it ended up taking us a while to get there. I was well ready for a martini by that time. They had billed the lounge as "... the place to be and be seen ... edgy and intriguing, the Bösendorfer Lounge, the namesake of the Imperial Grand Bösendorfer piano (one of only two in the world) features a round bar decorated in black marble..." We arrived at 11:00 to find out the jazz had finished for the evening. The piano room called the "Klimt Rotunda" sat in this round room that was a junction between the restaurant and the bar and was a shrine to this Imperial Grand Bösendorfer piano and dead as a tomb. And a DJ had set up in the bar to spin trip-hop mixed with R&B, not horrible but not what I came to hear. We still had our Park-Hopper passes that got us into all the Disney Parks, so I thought, "why not try Pleasure Island Jazz Company?" It is quite a drive from downtown so I called to make sure they still had music going on, since my first experience at the Bösendorfer indicated early shutdown. I asked if they had music at the club and was assured that there would be live music until 1:00 AM. I asked what type of music could I expect and was told that Pleasure Island Jazz Company would have jazz. After "googling" for jazz in Orlando, the results came up with this about the club: "Featuring the hottest new jazz artists in the area, the Pleasure Island Jazz Company offers guests the chance to experience a true 'jazz club' atmosphere right in the middle of Downtown Disney.... the club is still a great place to stop if you are in need of a jazz fix. ... Smart casual attire suggested." Our attire was probably smart enough, certainly casual enough. We hopped on I-75 and headed south to Disneyland. Arriving at Pleasure Island we discovered that our park passes did not cover the entry fee (only for the 4 parks). We were there, we had come a long way, and I had not had a martini yet so we paid the $21.50 each to enter the island. I assumed that even a contrived and sanitized " true jazz club atmosphere" might be comforting. Well, the room was big, round and rugged as a barn. I would have thought we entered the wrong place except they had some jazz paraphernalia on the walls, frames containing little collections of items like a pair of Diane Schuur's sunglasses, Lionel Hampton's mallets and a music score, and some old photos. It was 11:40 and there was about a dozen people in the room waiting for the band. I ordered my Sapphire martini, they also had a nice selection of single malt scotch, and Beverly ordered an Oban. The drink bill came to $14, not bad. We relaxed and enjoyed our drinks. There was a table of rowdy folks front and center, the rest of the place was subdued waiting. The band was announced, the "Funky Blues Messiahs." Although they did not appear messianic, they were true to their billing playing 70's funk and rock covers. Needless to say we were very disappointed. People started leaving, presumably the ones who came to hear jazz. Other people started drifting in, liking what they heard. Eager to express our displeasure we sought out a manager, which was not difficult. A woman was sent to our table and said she heard that we weren't happy with the music. I handed her my business card, she read it questioning "Jazz Police?" I said, "Yes, we're the Jazz Police, you're busted!" I said that we had come in search of jazz and this was clearly not jazz. We had paid a $21.50 cover each to listen to jazz, only to hear the kind of music we could hear practically anywhere else for no cover. She explained that the cover is good for all the clubs on PI. "Do any of the other clubs have jazz?" "No, but you should have been here last week, we had a jazz singer then." She offered to send over her boss, so while we finished our drinks and waited for the boss, two women from the rowdy table front and center got up on stage to sing with the band. When the Manager arrived he said that he was sorry we weren't happy and we said this is called a jazz club but this isn't jazz. He said that the music was chosen by "Central Booking" to get people into the clubs. He said, "Look, these people are happy" and many were grooving to the funky beat, of course the people who had come for jazz had long since left. The rowdy table in front making noise were friends of the band, other people had been pulled in by the music, but they had not come to Pleasure Island in search of jazz, and their number was about equal to the number of people who had left because there was no jazz. He then said that by some people's definition this music was considered jazz. I was baffled. Now I believe in the "big tent" inclusive view of jazz, but there is a tent and some things are on the outside. I said that no one who knew anything about music would call this jazz. He said that maybe to "Hard-core jazz fans" like us this isn't jazz, but they program to please the greatest number of people. But he would not admit that the "Jazz Club" was one in name only. Like I said, just because Mickey Rat has big ears, don't assume he can hear jazz °o°. So, this is a desperate plea for help. If you know of jazz clubs in Orlando, please contact us so we can spread the word and so others can avoid our disappointment. As Mose Allison says "I'm not discouraged but I'm getting there." NOTE: Pleasure Island Jazz Company opened August 27, 1993 and closed in 2005. There is no jazz in Orlando, or if there is, I can't find it. The city has a House of Blues, and Disney's Pleasure Island has some oldies and disco and DJ clubs, but no jazz. 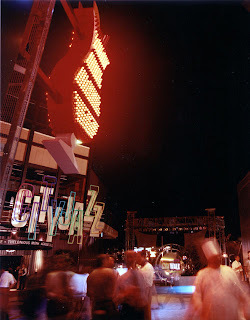 My hopes were lifted briefly by something called "CityJazz" at Universal Studios, but the description reads "Jam to high energy funk, R&B, soul, rock and more at Orlando's premiere nightclub. Listen to live music and see rare instruments and personal belongings of jazz legends." So...you can't hear the music, but you can see the artifacts? 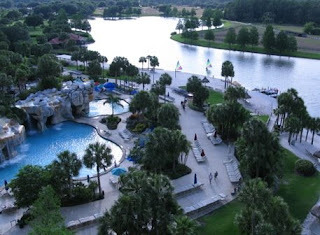 CityJazz image from Orlando Florida Guide Web site. The only true form of American Music, Jazz, is celebrated at CityJazz at Universal Studiso CityWalk. Home to the Down Beat Jazz Hall of Fame, the venue was designed with the assistance of The Thelonious Monk Institute of Jazz. The sound system and acoustics are designed for crystal clear music reproduction, and the cuisine is equally superior. Specialties include caviar, sushi and escargot. Guest can also choose for a collection of over sixty vintage wines, or choose a drink from the rolling martini cart. Whatever happened to the Down Beat Jazz Hall of Fame? To CityJazz? I'm curious. I'll contact DownBeat magazine and ask, then post any response. P.P.S. 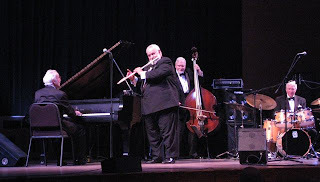 The Other Orlando Web site has plenty to say about CityJazz. Snippets: "Jazz club without jazz...Combines the intimate ambiance of true jazz club with the great sightlines of a conventional theater...an aura of ultra-cool sophistication...easily the handsomest performance space in all of CityWalk....has also been designed to serve as a state-of-the-art recording facility, just in case a big-name act is looking to do a live album. The great irony is that CityJazz...offers no jazz.... The only way to hear jazz in this club is to book it for a private event. Then they'll dig up a jazz combo." 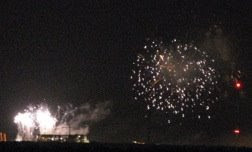 Saw fireworks last night somewhere off in the distance, not Disney World but still sparkly. The New York Times reported recently that an explosion destroyed 20 fireworks warehouses in China three months ago. I wonder how many places across the United States have fireworks displays every night? According to the Times, we should expect shortages. The link to the Times article looks, in part, like this: worldbusiness/17kaboom.html. George Plimpton wrote a book about fireworks in the 1980s. 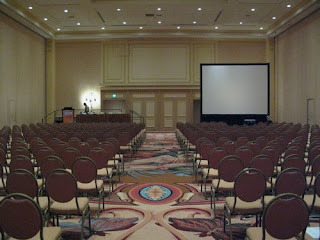 Below, two views of the room where I gave my presentation. Eeeeeeee! Freaking big! In fact quite a few people showed up and it went well. Scene: The hotel bar later in the day. Views from our hotel room: a corner suite on the 7th floor of the Hyatt Regency Grand Cypress. It's huuuuuuuge. All this green, with flashes of red flowers, is lovely after our long Minnesota winter. 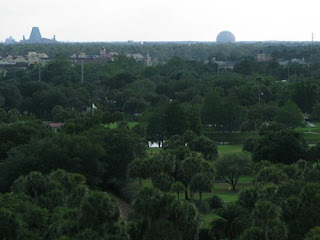 That's Disney World in the distance; the round ball at the right is Epcot. We're told we can see three different Disney fireworks displays at night. When you want a great hotel room, it matters whom you know. Or to whom you're related. I'm suffering major live music withdrawal with no relief in sight. Because I am, in some things, a horrible procrastinator (despite the fact that I'm supposed to know better), I've had to stay out of the clubs and away from the fun for several days to prepare for a conference this coming week. So I've missed Connie Evingson and the start of the Sur Seine festival and Bruce Henry and the Ellen Lease/Pat Moriarty Quartet and the Jazz Piano Competition and I am not happy at all. Making things worse is my friend Andrea who keeps sending emails about how fabulous all the music is that I'm missing and she's hearing, thanks very much, Ms. C., you're mean. If only I were going somewhere I could hear live music (preferably jazz) but I'm not, unless Orlando has a hidden subculture or suddenly moves a lot closer to Miami. 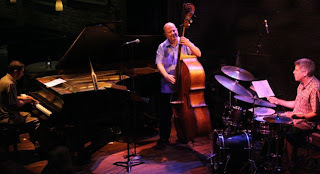 At least I can listen to Gordy Johnson's terrific new Trios CD on my iPod. 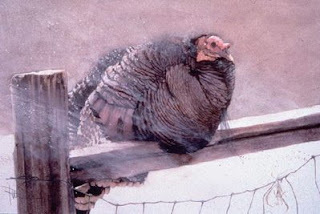 Cold Turkey by Ron Parvu. Watercolor. Saginaw Art Museum. 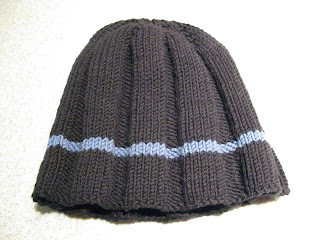 After Jeremy wondered aloud why Chris Bates had a hat and he didn't, I knew it was time to start knitting or else. Jeremy does not wear hats that cover his ears (at least, not that I've ever seen—maybe only in winter?) 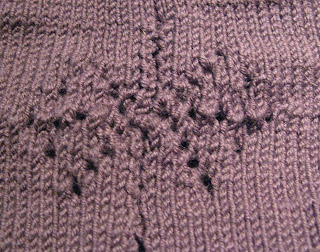 so I had to rethink my pattern. HH tried this on and it looked good on him. My son took me bowling for Mother's Day. It was tons more fun than brunch at a restaurant and I highly recommend it. We met at Memory Lanes, ate egg sandwiches, drank beer and Bloody Marys, and I still managed to break 100 (on the second game). 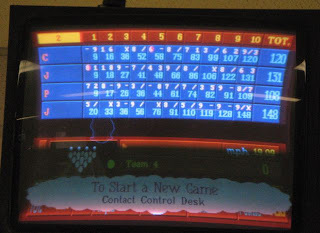 Not so bad considering the last time I bowled was before electronic scoring. Also on the second game, HH turned into a bowling fiend, sending balls silently streaking down the lane at nearly 20 mph and smashing out strikes and spares. We were late getting there because we ended up behind a wagon train that was making its way up Highway 55. At first the traffic slowed. Then we noticed a street cleaning machine that was sweeping up what looked suspiciously like horse poop. Then we passed the machine and noticed the actual horse poop by the side of the road, and hoofprints. 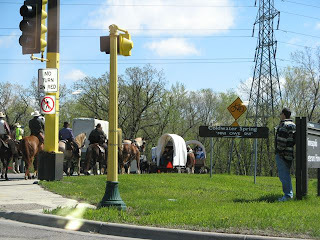 Then the traffic came to a standstill and we saw a big WAGON TRAIN AHEAD sign. I learned later that it was part of Minnesota's sesquicentennial celebration and Native American protesters had blocked it on Saturday as it headed toward Fort Snelling. It was an utterly implausible excuse for tardiness. 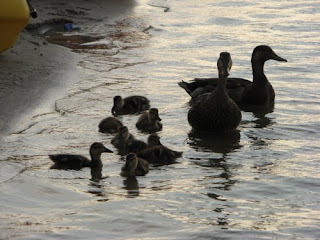 Luckily HH had his camera. The day started out sunny and perfect but turned to rain by mid-afternoon. The pots were wonderful and the crowds were strong, especially at Briscoe's, where people came up the steps in waves and stood in long lines to pay. We all found things we loved and brought home. Best to start saving up for next year. Top photo: The scene at Briscoe's during a relatively calm moment. Here's where we eat and drink beer. 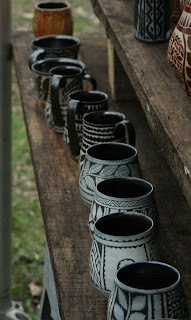 Below: Matthew Metz's intricately carved tea bowls and mugs. 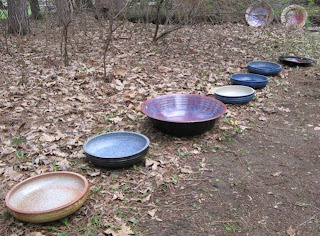 Win Byers's serene and beautiful bowls. Surprisingly lightweight, endlessly useful. 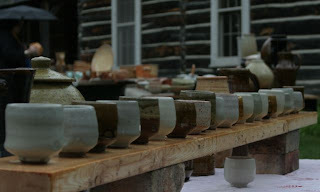 Wisconsin potter Sarah Dudgeon traveled by limousine with her Wednesday-evening class. Tea bowls by Guillermo Cuellar. The second installment in Kevin Barnes's jazz film series is a kick in the head and a reminder that New Orleans is our national shame. 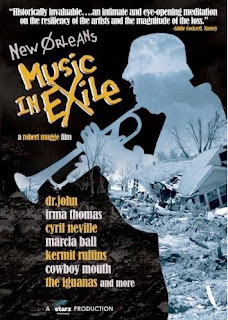 Documentary filmmaker Robert Mugge begins with aerial scenes of Katrina's destruction, then brings us back down to earth and into some of the devastated buildings including Eddie Bo's coffee house and Irma Thomas's club. Interviews with Dr. John, Cyril Neville, the Iguanas, ReBirth Brass Band, Cowboy Mouth, Jon Cleary, Stephen Assaf, Mark Samuels (owner of Basin Street Records) and others reveal how the hurricane has affected the New Orleans music community. Some artists evacuated to Austin, Houston, Memphis, and Lafayette and remain there (in Texas, there's now a band called the Texiles). Others are trying to stay in NOLA. Some lost everything they had. Without exception, it's no longer an adventure, only an ordeal. I've been curious about Basin Street because I have seen and heard several of the label's artists: Los Hombres Calientes, Irvin Mayfield, Henry Butler, Dr. Michael White, Kermit Ruffins. According to Newark's public jazz radio station WBGO (coincidentally another Jazz 88), "Before Katrina, the company had offices on upper Canal Sreet and a small full-time staff. There was the synergy of all nine artists living in one legendary city, creating and selling local music with national promotion. After Katrina, only the website was standing..... Both the offices on upper Canal Street and Mark [Samuels'] home in Lakeview were destroyed." Samuels relocated for a while to Texas but has returned to NOLA, where he lives in the second story of his home and runs the company out of the gutted ground floor. He writes a blog that's mostly about his artists with occasional flashes of fury at the ongoing situation in his hometown. The evening at BLB was supposed to begin with a performance by the North High Jazz Ensemble, a student group that rarely gets the chance to play out. But someone decided that students can't perform at the Bryant Lake Bowl because alcohol is served, so North High faculty members Tom Cross (keyboards), Ed Gitner (trumpet), and Jesse Buckner (drums) graciously stepped up to provide the live music opener. Up next in the film series: Imagine the Sound, a film by Ron Mann (made when he was 22) that profiles four musicians vital to the evolution of free jazz: Cecil Taylor, Archie Shepp, Bill Dixon, and Paul Bley. Thursday, June 12, Bryant Lake Bowl, doors open at 6, live music at 6:30, film at 7, ten bucks. To reserve tickets, send Kevin an email: KevinB@Jazz88fm.com. Kristen makes life easier for anyone who wants tickets to an upcoming show at the Dakota—like, for example, Sheila E or Roy Haynes or Buckwheat Zydeco or Patricia Barber. She manages the box office with grace and skill. 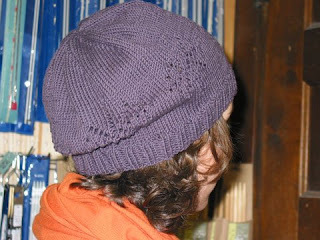 She has helped me many times so here's her hat, with a lacy pattern of stars, modeled by a visitor to Linden Hills Yarn, my LYS. Top photo borrowed from Chris Rieffer's photostream, a link from her blog. 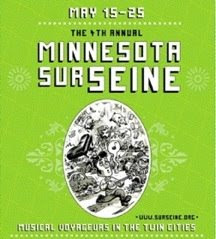 It breaks my heart that I'll miss most of this year's Minnesota sur Seine music festival. I'll be at a conference and won't get to much of the good stuff: Tony Hymas playing Debussy, the French rappers, Tim Berne. It's tough to live in a town with so many musical choices (she says, trying not to sound smug). 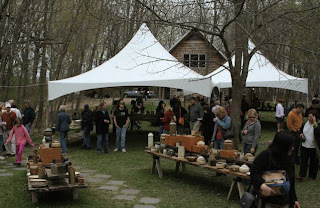 Earlier I spoke with festival co-director Sara Remke for this week's MinnPost column. More from that interview follows. View and download the schedule on the festival's Web site. 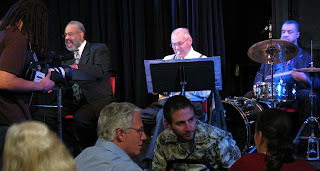 On opening night with Anthony Cox (basses) and Raymond Boni (guitar): Anthony is someone we've always loved. This year he'll play with Boni, a gypsy guitarist and free jazz guitarist, very academically trained. Musically I think it will be very subtle, a quiet opening. On "An Evening with Federico Garcia Lorca": There will be songs, followed by poetry in Spanish, then flamenco music. After, we'll go to the Black Dog for a big party. We've invited some dancers. We can't say for sure they will come but you never know.... Violeta [Ferrer, who will read Lorca's poems] was a flamenco dancer in her early years. She's in her late 70s now. On "Breakfast with Kylie": Guitar player Noel Akchote covers Kylie Minogue's songs. He's done a whole album dedicated to her and how she inspired him. It's just beautiful. I've been driving around in my car listening to it. 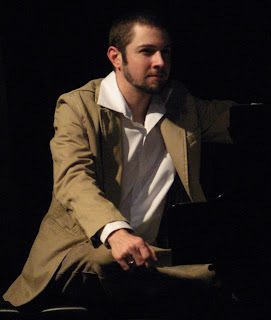 On "L' Apres-Midi des Faunes" with Benoit Delbecq and Dave King: Delbecq will probably play prepared piano. This show is a way for him and King to play with their toys. On "Fest Noz at the Black Dog": That's a big secret. We'll announce it later. 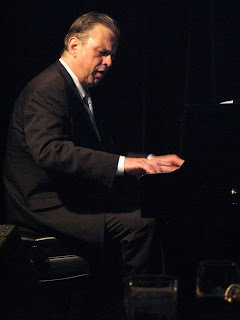 On "An Evening in Paris": Tony Hymans and Jean [Rochard] did a three-CD set of Tony playing Debussy and Satie. Tony has been playing a lot of classical music lately. For a lot of people, that will be a side of Tony they haven't heard. Jean says it's quite rare to play all 12 Debussy etudes. 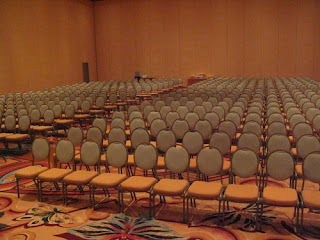 On "Echoes of Truth, Fire Music": I think there will be a few guests. I asked Sara, "What is sur Seine's biggest coup this year?" The biggest coup will be if we pull it off.